We are a first grade class in Seattle, Washington. Our classroom teacher is Ms. Smith. We have domino experts in our class-we put a video on twitter to share. We hope you like our domino video We each have our own iPads. We have many sports teams in Seattle including; the Huskies, the Mariners, the Seahawks and the Sounders. At school we like to play kickball, soccer, American football ( with no pile ups! ), wall ball and of course we love to read and write! What is your school like? We are excited to be part of the primary blogging community! This week we have been practicing making inferences using non-fiction texts. On Monday, students read a Time For Kids article about ladybugs and worked together to draw conclusions from it. For example a group of students said, “ We infer that the ladybug in the picture is fully grown because it is shiny, and the text said that adult ladybugs shimmer when they are done growing.” Students have been practicing using pictures and words and their own background knowledge to come up with an inference. They have enjoyed this unit and have worked extremely hard to complete all of the tasks! Later this week, we will be working on finding the main idea in texts. 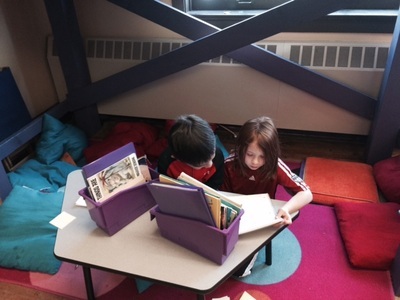 When I first heard about using books clubs in primary grades, I was a little skeptical. I didn’t quite understand how a book club would translate into the first grade classroom. After our first book club this past week, I can say we are hooked on book clubs! To begin, Mr. Elliott, Ms. Ream, Sabrina and Matt came in to model a book club for the class. The conversation was full of text to self and text to world connections. We eve got to learn a little bit about Mr. Elliott paper route he had as a kid! On Friday before school, Ms. Ream and I snuck a book into each student’s book box with a large pack of sticky notes and a pencil. 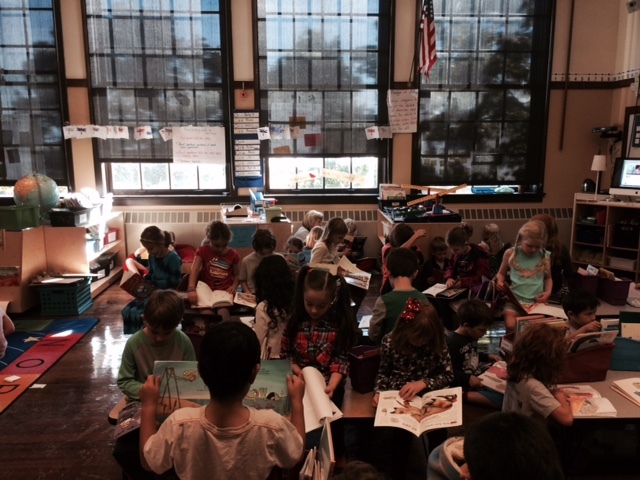 Students could not wait to read their book! In order to prepare for the book clubs, student read their book 3-4 times and placed sticky notes throughout the books. They sticky noted connections and questions they had while reading. Most books were bursting with sticky notes! We met on Thursday in our first book club groups. We could not stop talking about our thinking and referring back to places in the book that were meaningful to us! The room buzzed with excitement! The work that was created is thrilling-all students made great inferences and connections to their books. Book clubs will become a regular part of our reading throughout the rest of year. As first grade physicists, we have been learning about what properties make balls good bouncers and rollers. We have studied texture, shape, weight and if a ball is hollow/solid. On Friday we got a chance to put all of this learning into action and create our own balls with the goal of being able to take the ball outside and play with them. To begin, a former student came and shared what he learned last year with the ball he made that could be taken outside and played with. His learning helped to inspire the class to perservere while they were designing and reworking the ball they would create. Next we watched a video of a boy making a ball out of plastic bags in Africa to get ideas on how to shape and pack the materials into a strong ball. Then we went go to work-on all the tables in the classroom, there were recyclable and reusable materials that families have sent in for the past few weeks and each of these items was put to good use. The classroom got a bit noisy and exciting as students shaped, tested and reworked their designs. Finally, we took the balls outside and attempted to play with them. Some worked better than others and one got to be used as the soccer ball for last recess! This week was school wide Dwankhozi week at Queen Anne Elementary. We kicked off the week with a special Monday Morning Meeting. On Monday afternoon Ms. Cryan Leary, Ms. Ward and Ms. Marks came to share about their experiences in Zambia. It was a lot of fun and generated a lively conversation. The highlight of the whole week was the Dwankhozi gallery walk we got participate in. We explored different uses for fabric, how to it felt to carry large amounts of water, tasted Zambian food, played soccer with balls students made out of plastic bags, played/danced to Zambian music, and listened to stories told by Mr. Bailey! The follow photos show students engaging in all the fun activities. Thank you to everyone who helped put the week on. This past week we have immersed ourselves in reading and writing nonfiction (informational text). We began by book shopping for good fit books in nonfiction topics we were interested in. 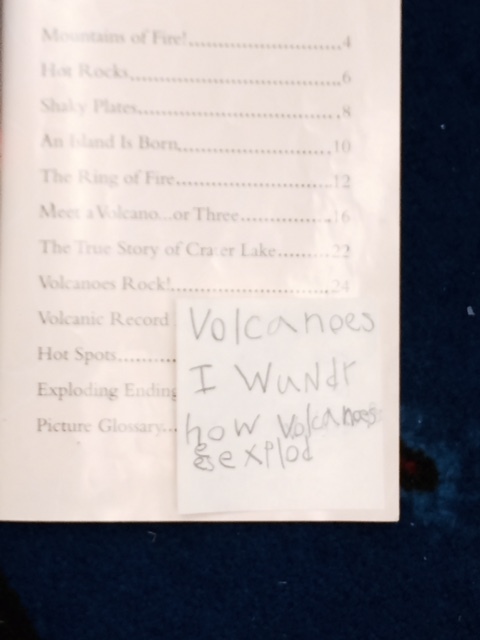 Each student found three books on topics they were interested in and could read most of the words in the book. The next day, I introduced our Wonder chart. We discussed things we might wonder about such as “Why do caterpillars eat leaves?” During our reading workshop, students jotted wonders they had on sticky notes and placed these wonders on our Wonder chart. Pretty soon our chart was so full, we couldn’t see the wonder heading! I realized that we needed our own wonder journals to keep in our notes in. Wonder journals also give a place for students jot their wonders and a place to answer their wonders if they find the answer in their reading. Wonder journals have brought an excitement and energy to our classroom during reading workshop. They have also given students a renewed sense of purpose while they read. Instead of just reading for pleasure, we are reading to find out about our world! It has been thrilling to learn about all the interesting things our world holds. We have fallen in love with National Geography readers series. These are great nonfiction books on high interest topics with engaging pictures and captions. If you would like to support our classroom, we are always looking for more of these books. They are easy to find on amazon and cost $3.99. We are looking for these books on all topics and would love to have more to share and read in our classroom. 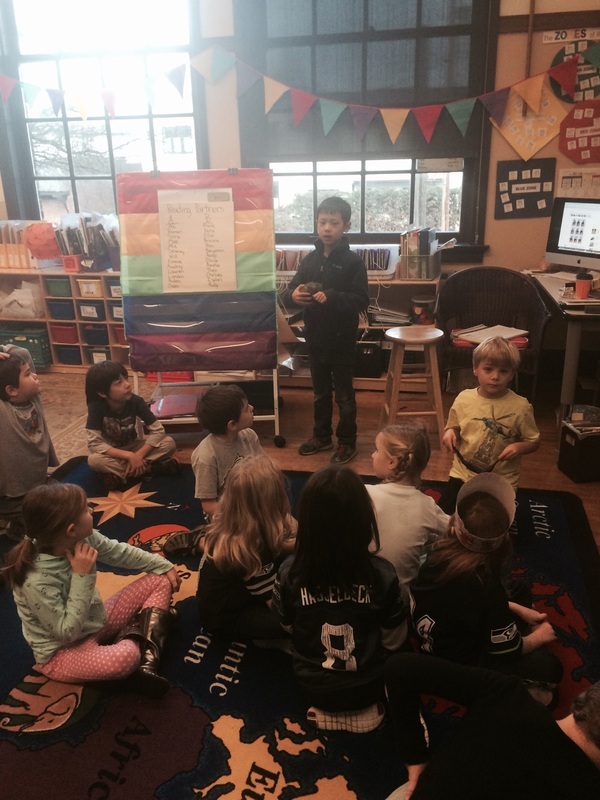 We are a classroom of first graders in Seattle, Washington. We love to read and cheer for our football team the SeaHawks. We also like to write. Right now we are writing small moment stories, which are true stories from our lives. In our classroom we have a purple and orange reading loft. It is purple and orange because those are our school colors. Each student in our class has an ipad with their picture on so we can tell whose iPad is whose. We have free choice on Fridays. We have a class pet, two fish. The fish are named Fred and Ted. Our teacher's name is Ms. Smith. We can't wait to meet all our new friends through the primary blogging community! We are wondering if we will be able to Skype with any of the classes in the community. We have been following several classes on twitter including all the Queen Anne classrooms that have a twitter account. This week we noticed that Ms. Meck’s class was posting about learning about the Pledge of Allegiance and the United States flag—two subjects we had not yet started to study. We tweeted at Ms. Meck’s class that we would love to come and have them teach us! Through our tweets back and forth we decided that we would go Friday morning to their class and do a small part of read to self as a whole group and then they would teach us! I was a little nervous as teacher as how it would go to have 52 students in our small classrooms, however, both classes were amazing!!! 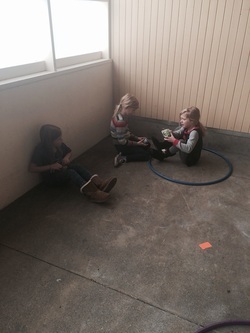 We filed in and found quiet places to read next to Ms. Meck’s students. We all read silently for 10 minutes and then Ms. Meck gathered us on the rug to discuss the Pledge of Allegiance and the flag. 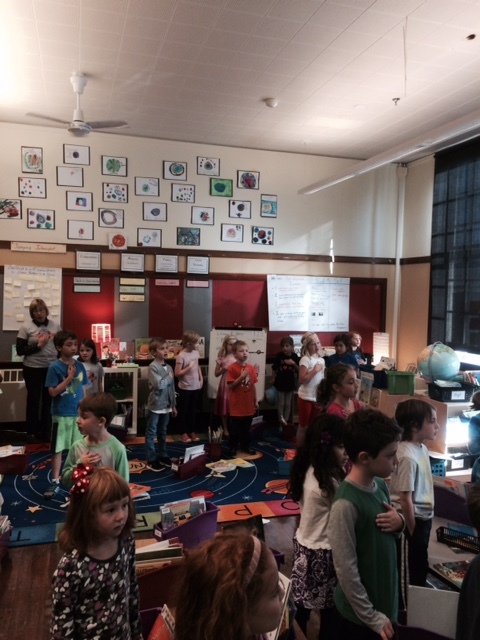 Then a student from Ms. Meck’s class and a student from our class lead the whole group in the flag salute! 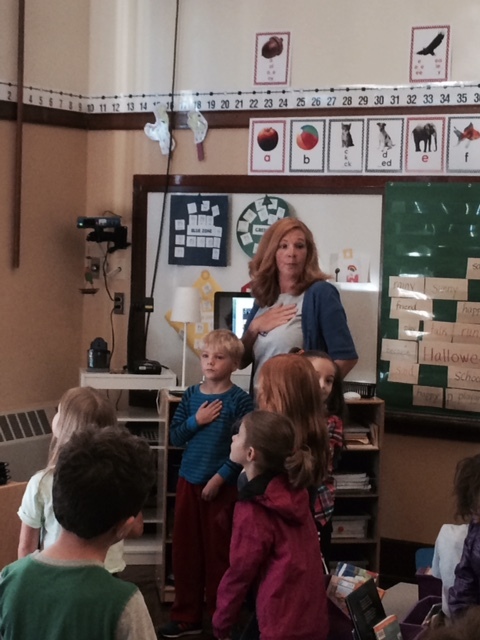 It was a great introduction to the flag salute and a great way to connect with another classroom via twitter. Part of my goal of using twitter this year is to connect both near and far with classrooms and families. Please tweet at our class or like our posts. We love to see what our tweets are inspiring! A reader sets a realistic goal of 5 books during read to self. This week in readers’ workshop, we focused on setting goals for our reading. 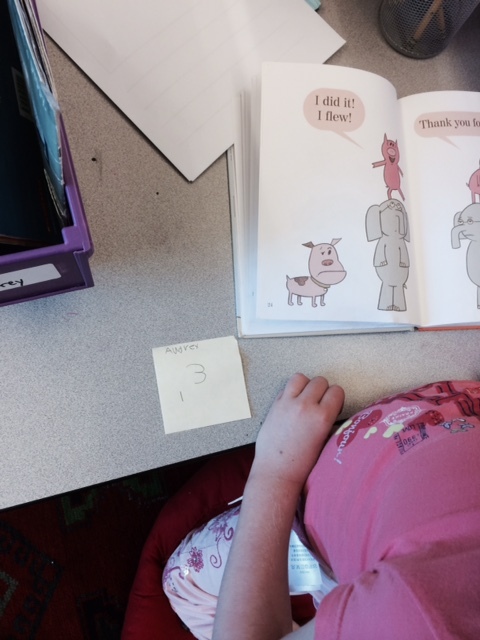 Each day as I dismiss students to go to read to self (independent reading) I give each student a sticky note. 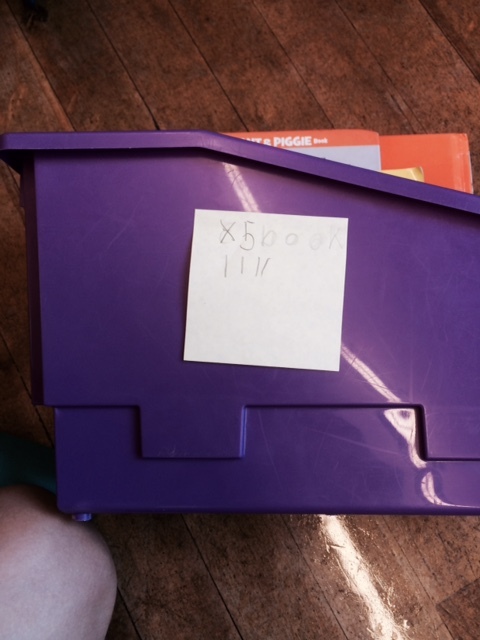 Students take this sticky note and write their name and the number of books they want to read during read to self on the sticky note. They then make a tally mark for each book they read during this time. 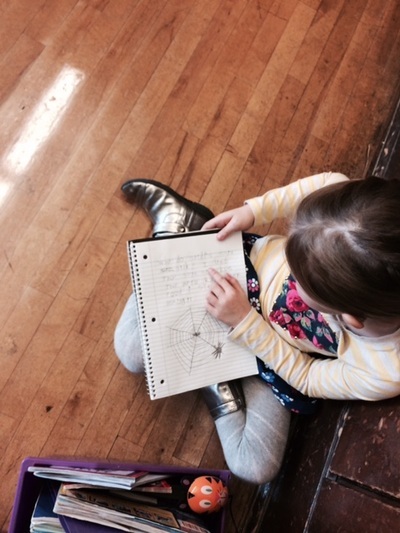 At the end of read to self, we reflect-were you able to meet your goal? Why or why not? Maybe you wanted to read 10 books, while a worthy goal may be a bit unrealistic for the 15 minutes we have built our independent reading stamina. Or maybe you beat your goal! Wahooty! Then for the next day, you know to set your goal a little bit higher. By teaching students a book goal setting strategy, students are able to learn and reflect about themselves as readers. They also learn to set reasonable, attainable goals for themselves. Additionally, making sure they meet their goal can be very motivating. In first grade, we do not give homework, however, students should read a minimum of 20 minutes nightly. During this nightly reading, try having your child set goals for their reading and then reflect on their goals. Keeping track with tally marks.